Scottsdale, AZ (Feb. 5, 2019) – America’s Queen of Speed, Valerie Thompson, will kick off one of Europe’s largest celebrations of two-wheel racing and cruising at the 2019 Carole Nash Irish Motorbike & Scooter Show on March 1 in Dublin. 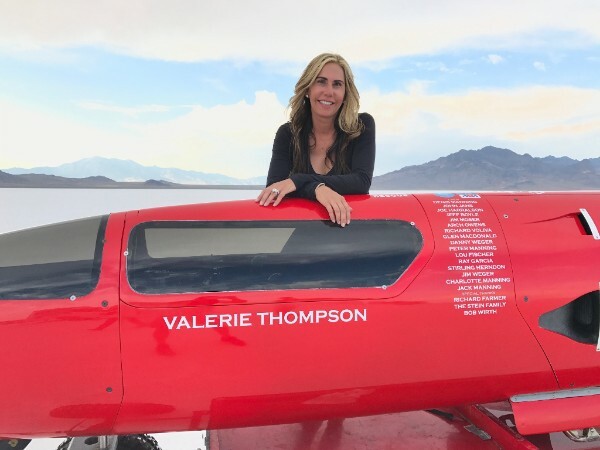 Thompson is the only woman to attempt breaking the world’s fastest motorcycle record of 376 mph and the first female to exceed 300 mph in a two-wheeled streamliner. She set a new land speed record of 328.467 mph (528.616 km/h) at the DLRA Speed Week competition and survived a horrific 363 mph crash days later during the World Speed Trials in early 2018. “This will be my first visit to the Emerald Isle, and I can’t wait to get there. I’m looking forward to opening the Carole Nash Irish Motorbike and Scooter Show, especially as Ruth Lemass, the event organizer, has convinced me this event is one of Ireland’s biggest and most fun motorcycle celebrations,” said Thompson. “I hope to test drive some of the new 2019 models and experience Ireland’s beautiful cruising roads,” added Thompson. Thompson holds eight land speed records on a variety of bikes ranging from Harley-Davidsons to BMWs to Streamliners. She is a member of seven different land speed racing 200 MPH Clubs, one 300 MPH Club and is the only motorcycle racer ever featured in a Super Bowl commercial. “Valerie’s many land speed accomplishments have always impressed me and I’m definitely one of her biggest fans,” stated Ruth Lemass. “I’ve been following Valerie’s amazing career over the past three years and I’m so pleased she has agreed to attend our event as the World’s Fastest Female on a motorbike – a world class achievement,” added Lemass. The Carole Nash Irish Motorbike & Scooter Show is a 3-day celebration scheduled March 1-3, 2019 at the RDS in Dublin, Ireland. This event showcases Ireland’s first view of 2019 motorcycles, new after-market products, clothing fashions, touring holidays and road racing heroes attracting over 27,000 motorbike fans worldwide for a weekend of high-octane racing and entertainment.